Cholera was a greatly feared disease that could spread with speed and with devastating consequences. It arrived Britain in 1831 on a ship docking in Sunderland. It spread around the country causing an epidemic in that year. Epidemics also hit in 1848-49, 1854 and 1867. In London it is thought 7000 people died of the disease in the 1831-32 outbreak which represented a 50% death rate of those who caught it. 15,000 people died in London in the 1848-49 outbreak. The disease usually affected those in a city’s poorer areas, although the rich did not escape. The cause was simple. Sewage came into contact with drinking water and contaminated it. There was a lack of understanding of how it spread. The establishment, doctors, scientists, believed that cholera was spread through the air, not water. That is was miasmic. All people knew were the symptoms and the masses of bodies that needed to be buried. An attack of cholera is sudden and painful. A victim would suffer severe h accompanied by painful gut cramps; extreme thirst and dehydration; severe pain in the limbs, stomach, and abdominal muscles; a change skin colour which left bodies bluish-grey. 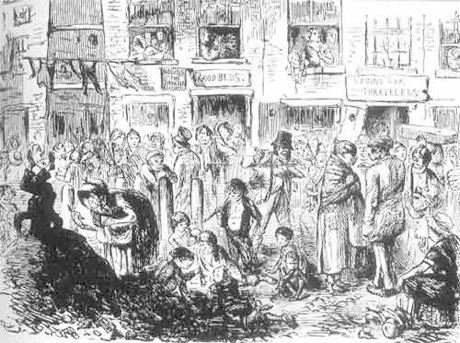 A much larger epidemic broke out in London in 1854. It spread in the most populated areas in London, such as Soho, Southwark, Lambeth and Broad Street. It was the worst that Britain had seen of Cholera. Life was a dreaded nightmare, people fled their homes and the streets and houses were filled with the stifling smells of the dead and the odours of the disease. Dr John Snow was living near Broad Street at the time and carried out a crucial piece of research that helped understand how Cholera spread. From ancient times, it was the medical orthodoxy that many infectious diseases emanated in a “miasma” from accumulated filth. This seemed to be corroborated by the fact that infectious diseases spread with frightening speed in poor, overcrowded, filthy areas of cities. When cholera arrived on the shores of Britain for the first time in the epidemic of 1831-2, the medical orthodoxy of miasma was assumed. John Snow was not an orthodox society doctor. He was the son of a labourer in Northumberland, trained through an apprenticeship to a local apothecary (somewhat like a GP) from age 14. He encountered cholera first hand: when the first epidemic struck through the port of Sunderland, his master,William Hardcastle was fully stretched in Newcastle, and Snow, at 18, had to be the sole practitioner to the mining village if Killingworth, which was hard hit by the epidemic. By the time John Snow was studying to be a doctor, in the 1830s, there were the beginnings of what would become new knowledge of the causation of disease. Van Leeuwenhoek, as early as the 17th century, had seen “animalcules” in water, under his new microscope. There were doctors, and Snow became one of them, who were reaching for a theory of disease caused by contagion. Snow came to London – he walked there! – in 1836, to complete a proper training in medicine, and he “put up his plate” in Soho in 1838. His first appearance on a wider stage in London was as what we would now call an anaesthesiologist – ether and chloroform were new tools then, and Snow went about exploiting them in a precise scientific manner. He did well – he attended on Queen Victoria for her confinement with Prince Leopold in 1843. This practice, with its mastery of the behaviour of gases, put Snow in a strong position to challenge some of the claims of the miasmatists, which he did even at the cost of appearing to be very eccentric when he defended the “noxious trades” against a charge of causing infectious disease. As science developed in the eventual direction of understanding water-borne diseases, so was water engineering progressing. By the 1830, one water company, the Chelsea, had a brand new water sand-filtration system operating in the Thames at Pimlico, invented by a James Simpson, who will feature in our Seething Wells story. It is remarkable that Simpson’s new technology provided a way of trapping the disease-carrying bacteria in sludge decades before the bacteria had been identified. Cholera struck Britain again in 1848-9. John Snow was personally involved in an outbreak at Albion Terrace, Wandsworth Road, where he discovered that the drains had been designed so as to all sewage-laden water to seep into the drinking water. This, and other evidence collected by John Grant, a Commissioner for Sewers, form Snow’s thoughts He published, at his own cost, a short book ‘On the Mode of Communication of Cholera’ in which he proposed fecalised water as bearing the agent for cholera. His theories did not get a wide audience. By the end of the second cholera epidemic – 1849 – there were new many stream of activities. Government had passed the City Sewers Act caused a vast increase of the clearing of cess-pits (thought to be prime sources of miasma), and which had the side effect of making possible more systemic studies of what we would now call epidemiology, by making it easier for authorities to gather information from households – poor households, at least. The Lambeth water Company had decided – a very bold step – to develop a source of water outside the tidal basin of the Thames – they went to Seething Wells. Then, in 1853, cholera invaded the shores of Britain again. John Snow saw in the actions of the Lambeth Water Company a golden scientific opportunity. The relatively clean water from Seething Wells was “on stream” from 1852 – Snow could compare households that were alike in every respect except that some took their water from Seething Wells, and the others from Battersea (The Lambeth & Vauxhall Water Company). Snow had to suspend his survey when the cholera came to his doorstep in Soho – hundreds of people were dying around Golden Square and Broad Street in September 1854. Snow worked with the local Vestry (the people responsible for the poor of the Parish), first convincing them to disable the pump at Broad Street that he was convinced was in the line of causation. And then working, with a local curate, Henry Whitehead, to show that, indeed, the water in that pump was infected (from a cess-pit into which the nappies of a cholera-infected baby had been rinsed. John Snow published a second edition of his book, completing the “Grand Experiment” comparing the two sources of water, and publishing what they had discovered in Broad Street. For him, it was convincing proof that cholera was water borne. But the world did not abandon its orthodox prejudice for miasma as easily as that. There was a much bigger study, exactly on the lines of Snow’s groundbreaking study, conducted officially, which proved more convincing evidence. (The author of this study, John Simon, failed to acknowledge Snow’s prior work, which caused a great furor.) But it was not until a further epidemic – 1866 – that people really came round to the view that Snow had the truth. Sadly, Snow had died by then, in 1858, at the age of 45. By then, all of the water companies serving London had been compelled to follow the example of Lambeth, and source their water from outside the tidal Thames. The Chelsea Water Company was the last to move, in 1855, and they followed Lambeth exactly, to the Seething Wells site. As the civil engineers moved forward with the times, so did medicine. Pasteur established in 1864 that specific diseases are caused by specific microbes; this changed the scientific context hugely by the time the final cholera epidemic had worked itself out in 1867. In 1883 Koch isolated the specific bacillus that causes cholera, and in 1895 a vaccine was developed and tested in India, by Haffkine.